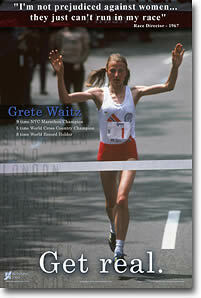 Grete Waitz - "Get real." "I'm not prejudiced against women...they just can't run in my race"
Grete showed the way by winning nine New York City Marathons and five World Cross Country Championships. She would compete in the first Women's Marathon in the Olympics and win a silver medal. 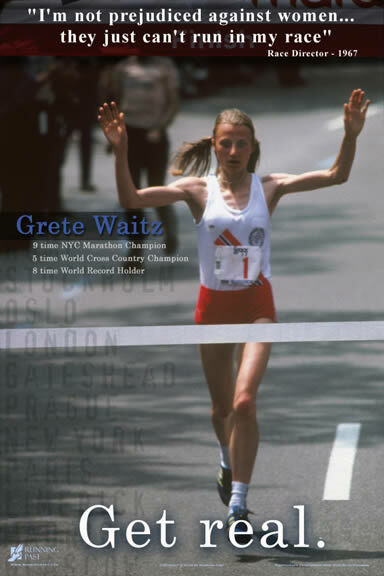 Our new poster highlights how Grete broke barriers through undeniable excellence, setting eight world records and leaving no room for argument. Photos may not be reproduced without written permission.